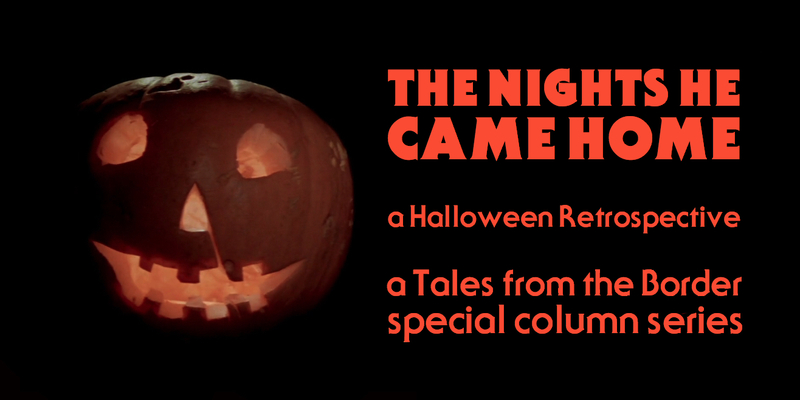 Welcome to the fourth part of The Nights He Came Home – A Halloween Retrospective! Over the course of October this new special column, in which I revisit all of the original Halloween films in anticipation of that most spooky season, will be running every Monday and Thursday. Then, beginning on the 26th of October, daily posts with the unifying theme of the horror genre will be posted, leading up to an article on my choice of the 10 greatest horror films ever made. 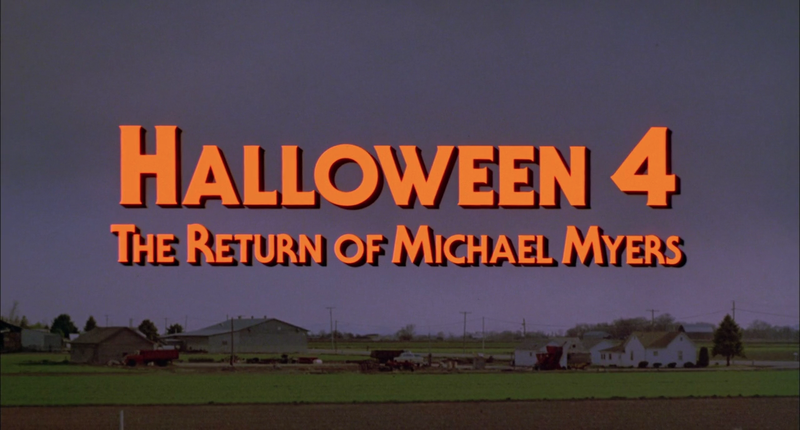 Today we examine Halloween 4: The Return of Michael Myers (1988), which saw the return of Michael Myers to the franchise. For previous entries in this series, click here. Whilst Halloween 4: The Return of Michael Myers is objectively a terrible film, there is so much here to enjoy that ultimately it’s one of the better Halloween films. Much of it is so random that viewers will be left laughing at the film, but sometimes, aren’t those the best kinds of films? It doesn’t hold a candle to Halloween (1978) and Halloween II (1981), but it holds its own rather well with an appealing cast and the return of both Donald Pleasence and the villainous Michael Myers. The ending of Halloween II is retconned so that both Dr. Loomis and Michael Myers survived the explosion, albeit with lots of burns. The film retcons the ending of Halloween II, so that both Michael Myers and Dr. Loomis have survived the explosion at Haddonfield Memorial Hospital. Myers has been in a coma for 10 years, whilst Loomis has escaped with a limp and burns on his face. When Myers is being transferred between sanitariums, he learns that the now dead Laurie Strode had a niece before she died. He escapes and returns to Haddonfield to hunt down Jamie Lloyd (Danielle Harris), whose babysitter Rachel Carruthers (Ellie Cornell) also gets dragged into the violence. 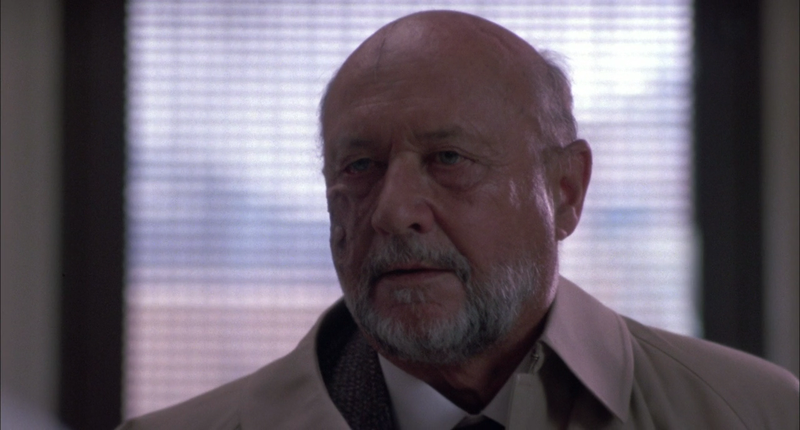 Dr. Loomis also returns to stop Myers. This is the first Halloween film that John Carpenter is not involved with and it really shows – the film suffers from a plot that recycles many moments from the first two Halloween films whilst also featuring some uninspired direction from Dwight H. Little. However, there are enough elements that the film holds together well. The idea of Michael Myers hunting a child is a really good one, as well as the electrics being blown near the end so the finale of the film takes place entirely in shadow at night. This particularly draws the film into a more gothic arena than the first two, and helps the film hold its own identity. The opening of the film, if cheesy, is also really strong. 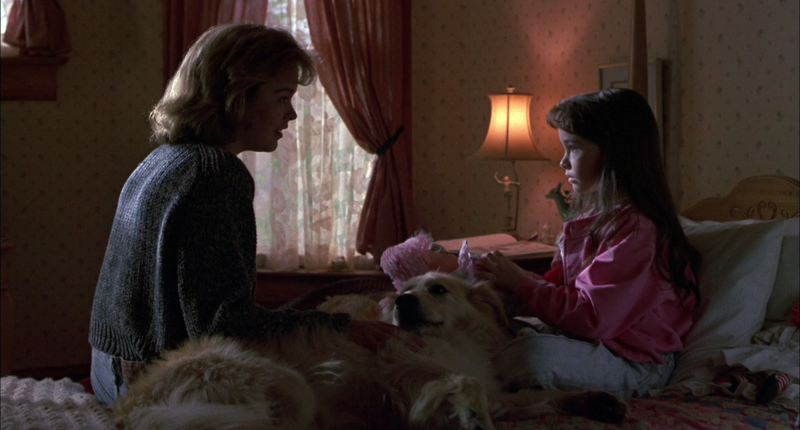 The opening shots are full of gloom and doom and the sanitarium is quite spooky. Danielle Harris and Ellie Cornell are appealing leads. Whilst I don’t think you could ever say the acting is particularly strong, the film sees the welcome return of Donald Pleasence to the role of Dr. Loomis. Whilst he is notably less athletic and agile than in previous films, Pleasence brings his wonderfully hammy acting to the awful dialogue of the script. How anyone thought this guy was a good psychologist I’ll never know, but again he is one of the film’s strongest elements. Likewise, Danielle Harris is quite good as the film’s lead character, Jamie Lloyd. Ellie Cornell is also decent, and together the two make for a likeable set of characters. It’s just a shame that the screenplay is just so awful in many respects – faults with the character’s intelligence come from the screenplay, not the actors. The film has some very well-executed deaths (pun intended) that are some of the most violent yet – at this point the violence is laughable rather than scary, and this is one of the reasons why I personally like Halloween 4 so much. A particular highlight is Michael Myers disembowling someone with a shotgun. It’s so ridiculous you can’t help but laugh. Or stabbing his thumb through a hospital guard’s forehead. Again, very laughable. 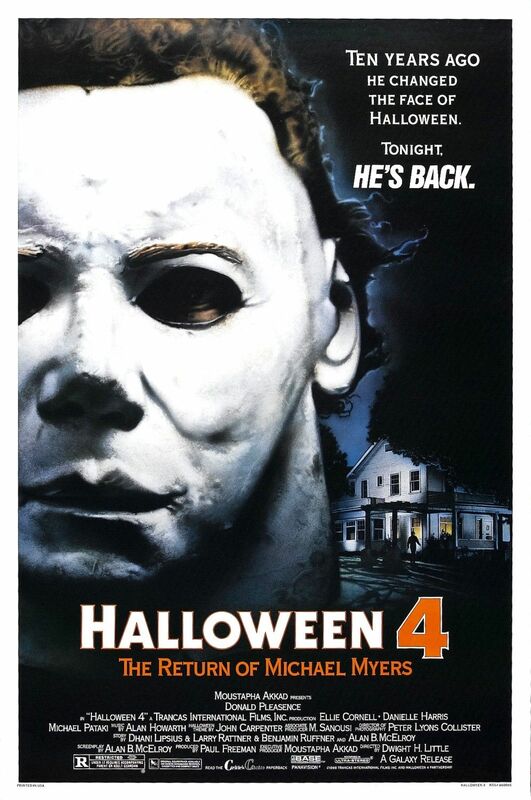 Michael Myer’s return is more than welcome despite the poorly replicated mask. Michael Myers himself proves once again to be a great slasher villain. When you see the carnage in the police station after his visit, with everyone lying dead, it really makes you want to see what Myers unleashed on a squad of policemen would look like. The idea of him as some unstoppable killer is a great, and I hope that in any future films this can be explored. 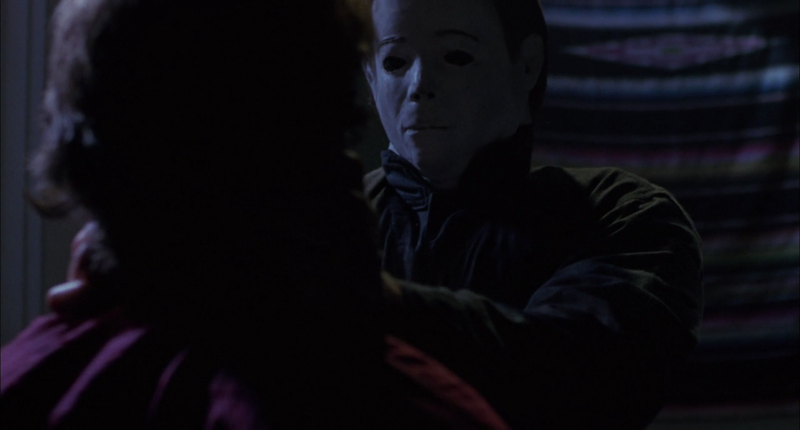 However, his mask looks nothing like the original mask in Halloween – somewhat of a disappointment because it does take you out of the film sometimes. I just wonder how he keeps getting a hold of masks that look the same! I doubt we’d ever see Myers abandon the white hollowed face, but it might be cool in some future films to see him use different masks in each entry. What proves most memorable about the film is the fantastic ending – I won’t spoil it for you, but it’s one of the best moments of the series as a whole, and one of Dr. Loomis’ best moments too. Disturbing stuff! The film was panned in the States upon release, but did well at the box office, grossing $17.7 million on a budget of $5 million. It was enough for a sequel to be immediately put in to development. Ultimately, no one can give Halloween 4 the honour of being a good film. But it is just so enjoyable as a soapy, trashy slasher film that it’s hard to knock it. Whilst it never reaches the heights of Halloween or Halloween II, it certainly does it’s job as a fun B movie. Recommended. Next time on The Nights He Came Home, we examine the direct sequel to Halloween 4, Halloween 5: The Revenge of Michael Myers, which sees Donald Pleasence, Danielle Harris, and Ellie Cornell return to do battle with Michael Myers. See you next Thursday!